As the world celebrated International Women’s Day this March 8th, so did we at the University of Exeter. The Women in Physics network co-hosted a social event with other STEMM network groups – the National Sciences Equality Network and Women in Climate. It was a lovely time to chat over tea and coffee and cakes and to meet other people from similar networks. 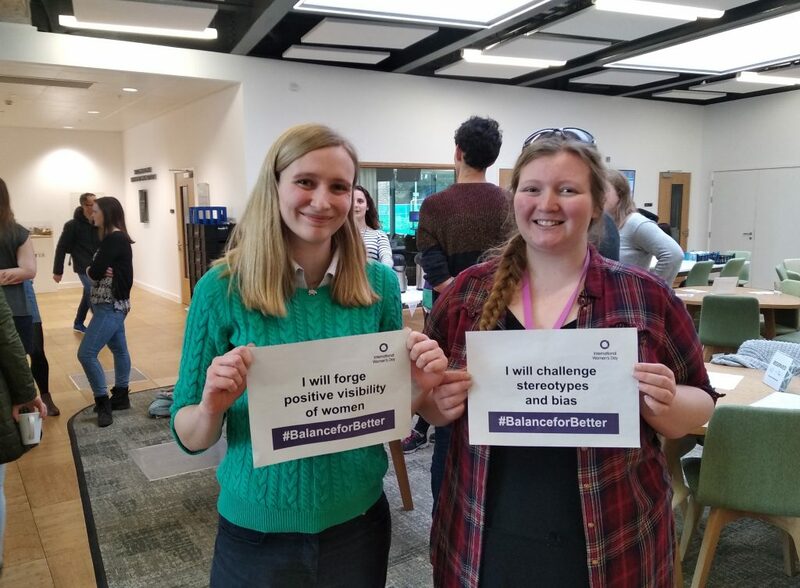 The theme of IWD this year was #balanceforbetter. We encouraged everyone to make a pledge to improve the experience of women – for example, “we will help forge a more gender-balanced world”. Here are the network’s chairs, Anna and Eve, making their pledges. The Women in Physics group was founded in 2017 and meets regularly for social events and discussions about the experience of women in physics and STEMM subjects in academia. To join our mailing list so that you can come along for these events (with coffee and tea included), please contact Anna Laws or Eve Nebbiolo. You can also follow our events on Facebook ( https://www.facebook.com/groups/1449762338423643/ ) and Twitter (@Exeter_WiP). PRISM, the Exeter-wide network for LGBTQ+ people and their allies working and studying in STEMM fields, held their first Speakers event of 2019 on January 15th. The network aims to promote the work of LGBTQ+ individuals in STEMM as well as sharing the successes (and failures) of diversity initiatives. Two members of the Department of Physics and Astronomy presented talks. Alison Young, an ally to the LGBTQ+ community, provided a summary of the STEM Gamechangers workshop which occurred in London in September 2018 and introduced the audience to the “Scientists are Humans” initiative she helped set-up. 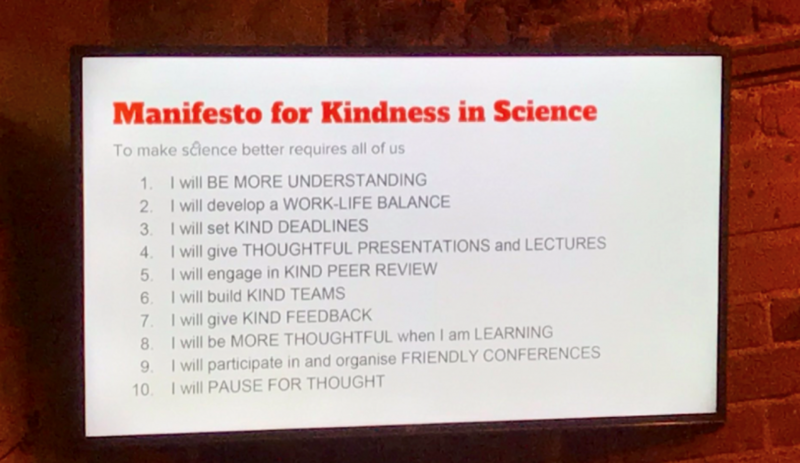 Her project aims to encourage scientists to “be more kind”. Their manifesto is shown below. Members of the physics and astronomy inclusivity group travelled to the Institute of Physics Awards Dinner 2018 on London on the 20th November to receive our Juno Champion Award. 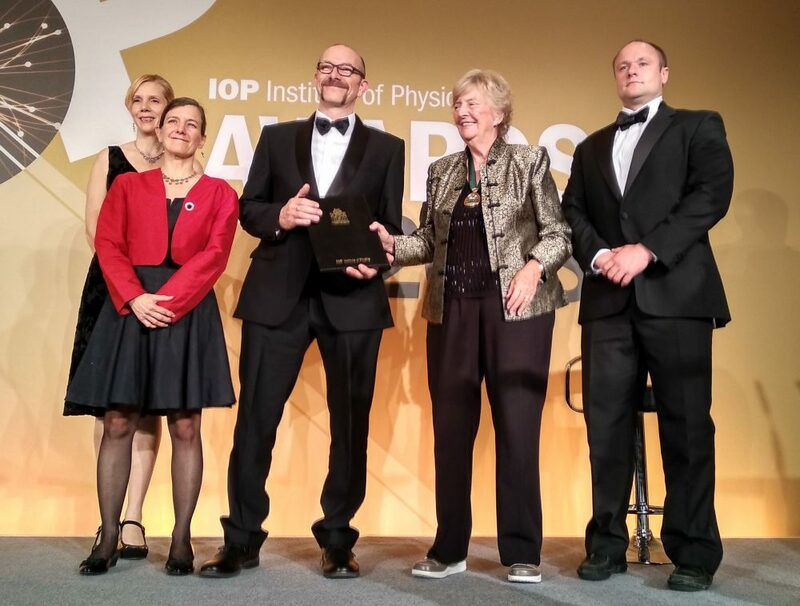 The award was presented by IOP President Dame Julia Higgins (L to R: Jude Meakin, Jenny Hatchell, Nick Stone, Julia Higgins, Nathan Mayne). Welcome to the Physics Inclusivity Working Group blog! Our inclusivity working group in the department of Physics and Astronomy is striving to ensure that our department is inclusive to everyone that studies, works and visits us. This blog will highlight some of the activities we are doing to help us achieve a fully inclusive culture.